As the story goes, my great grandfather William “Crack” Thompson and his brother Jess carried their Winchester rifles to Blair Mountain in the late summer of 1921. They were on their way to America’s largest armed uprising since the Civil War. Nearly 90 years later, Blair Mountain, in the heart of West Virginia’s Appalachians, is again a battlefield. In 1921, the coal miners of southern West Virginia organized into a force nearly 10,000 strong, determined to bring justice to the coalfields. Coal companies had long treated miners and their families as if they were disposable. In each mining community, the company owned the town, the store, and even the church. Workers were paid per ton of coal—a variable measure at the discretion of the company—and in scrip, a company-minted currency that could only be used in the company-owned store. A miner who got uppity, perhaps by joining the union, was often simply fired, his family evicted and belongings confiscated to pay whatever debts the company decided he owed. Not only were miners dogged by poverty, but injury and death in the mines were daily realities. According to the West Virginia Division of Culture and History, it has been suggested that a soldier in World War I “had a better statistical chance of surviving in battle than did a West Virginian working in the coal mines.”1 Working and living conditions in the coalfields were deplorable. In 1890, the United Mine Workers of America formed and quickly went to work organizing miners in Ohio, Pennsylvania, Indiana, and Illinois. Not until 1902 did it gain a toehold in West Virginia, and that was tenuous at best. Coal companies wielded a tremendous amount of power. They had hired guns and, worst of all, direct lines to state and federal government at every level. Miners had little recourse and no political clout. By the beginning of the 20th century, struggles between miners and coal companies had become increasingly violent. The 1987 film Matewan has given the coal wars of the early 1900’s marginal visibility, but arguably the greatest labor battle in American history began in the last days of August 1921, and few 21st-century Americans have ever heard of it. Most miners in Kanawha and some surrounding counties had joined the UMWA by 1921, but the inability of the union to make headway in West Virginia’s southernmost coalfields limited their reform efforts. As a last resort and under threat of treason charges, union men decided to march from Charleston nearly 60 miles south to the coalfields of Logan in an attempt to break the coal companies’ stranglehold on southern West Virginia’s coal miners. Thousands of mine guards, backed by state and local law enforcement and armed with machine guns, bombs and—by some accounts—poison gas, gathered at Blair Mountain to stop them. The miners were clearly outgunned, but they fought for their lives and for the livelihood of their families. On September 1st, President Warren G. Harding ordered federal troops, many recently home from World War I, to converge on Blair Mountain in support of the coal companies. Refusing to fight America’s military heroes, the miners surrendered. Crack and Jess Thompson hid their Winchesters in a hollow tree and walked home. The people lost. The United States government—of the people, by the people, for the people—came to the aid of business, and the people lost. It would be more than 10 years before the United States made any significant moves toward protecting the rights of West Virginia’s coal miners. The Battle of Blair Mountain was an amazing display of the American spirit, that fierce sense of justice and liberty we learned as children to respect and admire. It was also a sad commentary on the all-too-common injustices of business aided by the complicity of government. The new battle is much the same. In 1993, Arch Coal began buying up the land around Blair Mountain, clearing it of people and trees in preparation for a devastating surface mining practice called mountaintop removal. The people that remain are fighting—with lawyers instead of guns—but coal companies still have the full support of state and federal government. The one federal judge who has dared to rule against mountaintop removal is being directly challenged by the White House2, and the practice continues. The land around Blair Mountain is right now being transformed from mountain range to moonscape, and the people who live there are losing their homes, their health, and their history. Our history. It is difficult to have hope when justice loses again and again. It is difficult to believe that the American spirit I learned as a child to admire could possibly endure. But it does endure. I know it does because something in me burns to find that hollow tree that may yet stand on Blair Mountain and continue the fight. 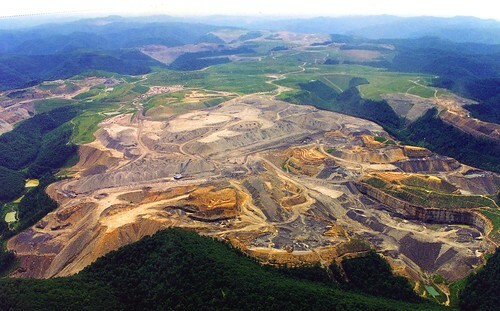 For a brief description of mountaintop removal, visit this page provided by Mountain Justice Summer. Good job. Your great-grandfather would have been pleased, as I am. The coal industry was built without regard to the human toll, and modern mechanized mining is being used to destroy the beauty of the state. Shameful. This Texas woman hopes that you find the tree and the Winchester. I also hope for a better outcome than aother “moomscape” in beautiful West Virginia. P.S. Nancy Thompson sent me your website.